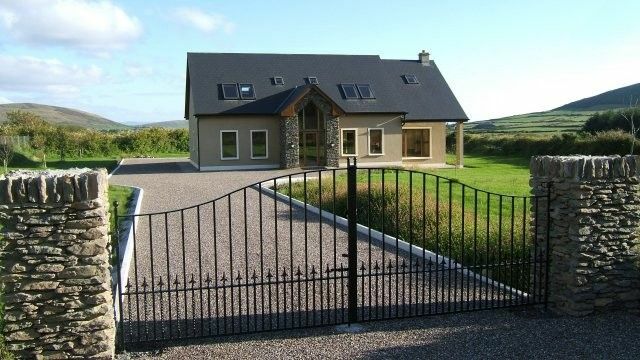 Modern 4 bedroom residence, short distance from Dingle town. This modern residence, which was constructed in 2008, is situated in a rural and peaceful setting and yet only a short drive to all the amenities in the surrounding Dingle Peninsula. Accommodation comprises of an entrance hall, open plan kitchen/dining/living area – split level, utility room, 2 bedrooms and bathroom on the ground floor. 1st floor comprises of a spacious landing & 2 bedrooms (both en suite). Facilities include:, washing machine, dryer, microwave, dishwasher, Television, oil fired central heating, underfloor heating, ample car parking, large garden & river running along the rear boundary of this property. A beautiful spacious house with amazing views and huge garden. Kids loved it and very close to Dingle town. Thanks, Glad you enjoyed your stay. Great location and overall house! Sparse decor but functions well! Thanks for your hospitality! Beautiful location and beautiful house...very spacious. House contained everything we needed. Would really recommend to all. Hier haben wir uns sehr wohl und sicher gefühlt. Ein ganz tolles, sauberes, großes Haus mit Allem was man täglich braucht. In 5 km ist man in Dingle und auch die anderen Touren lassen sich super von hier aus starten. Der Vermieter ist sehr nett und unkompliziert. Wir kommen auf jeden Fall wieder. Das Haus ist genial, es ist riesig groß hat einen schönen Wohn/Essraum und sogar einen Kamin. Der Garten ist auch nett mit der Bank und dem Tisch, dort kann man morgens seinen Kaffee genießen und den Sonnenaufgang beobachten. Notes;included is electricity, oil, linen, towels and free Wi-Fi.